We had quite a bit of fun playing with, and eating, tetrahedrons over the weekend. But, I thought before we went any further with three dimensional shapes, we should backtrack for a quick look at two dimensional shapes. 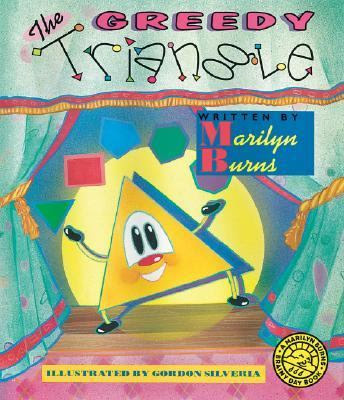 I've seen the Greedy Triangle by Marilyn Burns, recommended a number of times around the blogosphere, and thought it might be a good place to start. It's the story of a discontented triangle, who thinks his life could be more interesting if he just had one more side, and one more angle. So, with the help of a shape shifter (a shapeless blob, in a wizard's hat), he explores life as a quadrilateral, hexagon, heptagon, octagon, and nonagon, before finally deciding he likes his life best as a triangle. I found it a tiny bit monotonous, but the children were riveted. If you can't get a hold of a copy of the book yourself, you can watch it being read, library story time style, here, on School Tube. There are a number of online lesson plans available to go along with the book, too. Superheroes and Princesses has a companion art idea, Chronicle of an Infant Bibliophile, has a printable play along shape activity, and Mouse Grows, Mouse Learns has a shape craft suggestion. I also came across a couple of sites suggesting the use of a geoboard, for exploring shapes along with the story. Since, we've recently seen all the fun K, over at Joyful Learner has been having with her geoboard, I decided that was the way to go. We don't have a geoboard on hand, so I crafted a quick one, using a thick piece of Styrofoam, that came in the packaging of one of our Christmas presents, a bunch of screws, and a few pot holder loops. Ideally, a person would use nails hammered into wood, but I didn't have a piece of wood, or enough nails on hand, so I went with what I did have. I measured out a quick, one inch grid, on the Styrofoam, stuck the screws in, at each intersection, tossed out a few loops, and we were good to go. Actually, the children started playing with it, before I could even get all the screws into place. This type of construction would not be good for permanent play, or for toddlers, since the screws can be easily pulled back out, but it worked as a quick solution for us, in a pinch. The children like it well enough, and I can see enough future teaching potential with it, that I think we'll definitely be looking into making a sturdier version. While the younger children were busy playing with the geoboard, making shapes, and stories, I also cut them out a set of geometric lacing cards, from fun foam. I used a small printout of the shapes, as a guide for the angles, but I increased the sides. ...and the number of corners, or angles, on the other. Again, you can find more math themed activities, and ideas, at this week's Math Monday link-up, hosted by Joyful Learner. Fantastic. We have a store bought geoboard that the kids enjoy, but I think the homemade versions are so cool. I really like the way you used the lacing too. I never would have thought to turn it over to see the corners. Oh, I really like the lacing cards. What a brilliant idea! I plan to play with geoboards some time this year, too. You ARE a mathematical genius, aren't you? Who else "whips up" a geoboard out of leftover foam THEN illustrates the concept of sides and angles with lacing cards? Wonder Mom - No, but if they ever want to make a space shuttle out of paper mache - I'm here for them! I love both the geoboard and the lacing cards. I really want to take the time and build Selena a geoboard, that is on my to do list. it's one of my favs!! Kimberly - We have a couple of their CD's in from the library right now, but I don't think that's on it. I'm definitely going to look it up! I have those loop thingies, that is such a good idea for a geoboard. I need to drag those out. Love it - a geoboard out of foam - being resourceful at its best. Your lacing cards are such a fantastic idea and a wonderful resource to learn the different shapes. You never cease to amaze me with your constant stream of creative and clever ideas. We love this book, and your geoboard looks really neat. We have both a small homemade and a bigger store-bought version - I really need to get them out one of these days. I LOVE your ideas. Do you think up everything yourself or so you have something you loosely follow? I'd love to know more about how you organize all these cool things you do. Leah - I don't really follow a plan, but I get lots of inspiration from the blogosphere, and the library :) Usually, if there's no link given, then it's my idea, or one used by everybody. I'm stunned by your brilliance! I love the homemade geoboard...I was thinking of making one out of wood and nails but never got around to it. I love the size of your board which enables more than one person to play with it. And the lacing cards idea is pure genius too. I will need to get my scissors and foam out and make some of those for our math club this Friday.